Home » MattLove » Looking for a Makeover? Thanks for your visit, I am glad you've found your way here. Please leave me a comment so that I can find my way to you. If you like the contents from this website please use the follow me or subscribe buttons both located on the right side bar. Thank you. 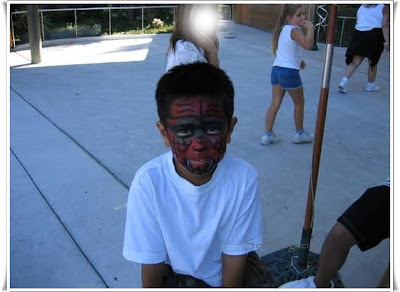 Wow, that is awesome face painting-- I thought it was Darth Maul at first! Love the picture! Happy WW! Wow Matt, I hardly recognize you. That was a great make over. 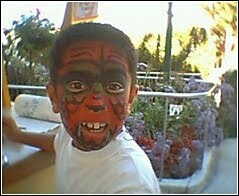 Wow...you were so young then, and the face paintings are just fantastic! I have never tried it but yes, it's a good job! I think I need a makeover like that. Face painters are very talented and children love them. Thank you for participating in the 'Face of the Week' meme at Spacial Peepol! So others may participate if they would like to! That is quite a face painting. You are definitely ready for some costume party! Great post.